Faded Glory Double-Breasted Faux Wool Peacoat With Hood - Only $12.00 (was $39.98) + FREE Store Pickup! 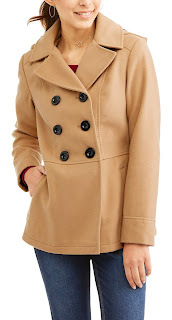 Right now, grab this Faded Glory Double-Breasted Faux Wool Peacoat With Hood on Clearance at Walmart.com for Only $12.00 (was $39.98) + FREE Store Pickup! 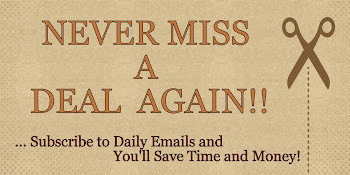 Several colors available! Dressing up for colder weather isn't always easy. With this Faded Glory Missy Double-Breasted Faux Wool Peacoat with Hood, you'll stay warm while looking stylish at the same time. Combining style and functionality, this Faded Glory piece delivers the best of both worlds in a way that will leave an impression no matter where you are. 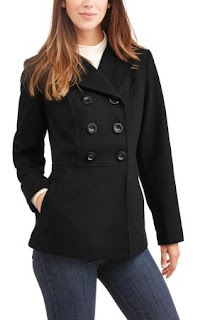 Features of this pea coat include faux wool fabric and slanted front pockets. Available in a double-breasted style, this piece is a perfect way to layer up in colder months. You can dress this piece up with a shirt or keep things casual and wear it over a sweater for a cozy look.